Described herein is a replication of Silvertooth’s experiment of 1986/1992. The analysis starts by re-performing the wavelength difference method described in these two papers and examining the distance required to move a standing wave sensor (SWD)/mirror system on a translation stage to register a phase inversion. After performing this procedure repeatedly over a number of sessions between June and December 2011, a similar 12 hour pattern of change was seen conforming to the original observation of Silvertooth. The experiment is then repeated using a new method involving measuring the frequency generated at the two sensors using an oscillating stage driven by piezo actuation. Finally, experiments are performed to try to determine the true cause of the diurnal pattern of presumptive wavelength change, focusing on the HeNe laser and its beam pointing stability over time. The final conclusion is that the wavelength of light measured in the system is not changing in a manner dependent on sidereal direction. The cause of this diurnal pattern turns out to be something far more mundane. Fig. 1: The “Silvertooth effect”. Numerous papers have been published for or against Silvertooth’s experimental conclusions, however, the rarity of Silvertooth’s standing wave sensor made it nearly impossible for anyone to attempt to reproduce the experiment in the same manner that he did. However, in early 2011 I was able to procure a thin film standing wave sensor from the Jülich Research Centre that eventually made replication of Silvertooth’s experiment possible. The following is a detailed description of what I discovered over the course of 18 months of investigation. The initial optical setups strove to reproduce the essence of Silvertooth’s experiment while simplifying the optical arrangements where-ever possible. The first arrangement attempted resembled the apparatus described in the 1992 paper, except with the figure 8 path change to simply a square, since the outcome of that 1992 paper was that the Sagnac effect was irrelevant to the experimental result. Fig. 2B: Photograph of the first optical arrangement. It’s known from the 1989 paper that a HeNe laser was used for the experiment, so I did the same – in our case our laser was equipped with frequency stabilization. I also used a circular polarizer to attempt to prevent retro-reflections from re-entering the laser tube. Similar to Silvertooth’s method, one mirror (labelled PZT) on the moving stage was actuated using a triangle wave signal generator to generate a moving standing wave through the SWD. By carefully adjusting the amplitude of the drive signal, it was possible to create the required AC output signal at the same frequency as the drive signal. This was also accomplished with the signal output from the PD output of the Michelson interferometer. 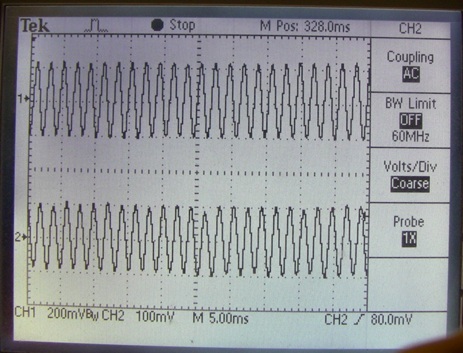 The two signals, SWD and PD were then displayed one above the other on a 2 channel digital oscilloscope. These two signals are shown in Fig. 3 below. These resemble figure 3a from the 1992 paper. Fig 3: SWD and PD signals displayed for referencing phase shifts between them. It was noted early on that the arrangement 1 was far more complicated than necessary – a simpler optical arrangement was created which preserved all the essential elements i.e. 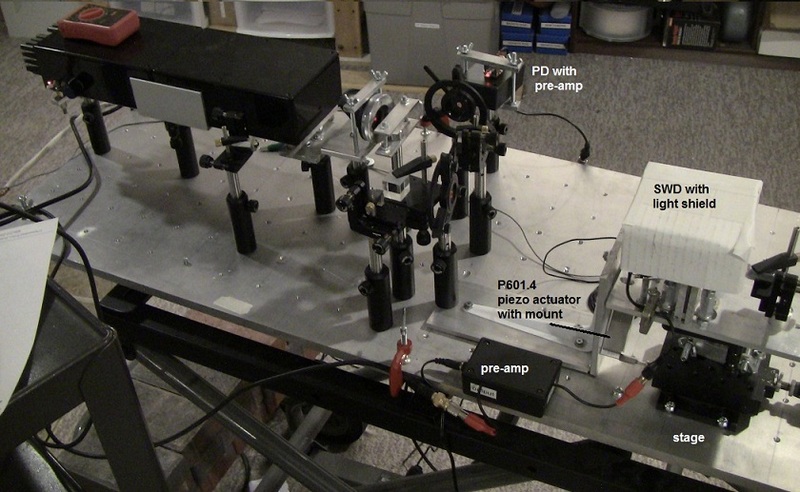 PZT control, moveable stage with both the SWD and the mirror on it, and the PD detector with Michelson interferometer. This is shown below in Fig. 4. Again, the PZT was controlled by a triangle wave generator. PZT1 was used to align the SWD sensor first, and then PZT2 was used alone to generate the fringes at both sensors. The outputs from each sensor often required amplification – this was performed using parametric filters adjusted to the triangle wave frequency to reduce noise, prior to display on the scope. Although initially the stage was moved by hand using a micrometer and the distance read off the handle markers, in subsequent experiments this micrometer head was fitted to a geared motor drive to allow the stage to be moved without touching it directly by hand. This served to reduce vibrations and spurious phase shifts. This arrangement is shown in Fig. 5. The entire optical breadboard was mounted on a rigid stand which was further weighed down with bricks to reduce transmission of vibrations from the floor. Fig. 5: The second optical arrangement. After completing a given session, if the lowest value was not zero, then the velocity was normalized across the data to place the bottom of each curve as close to zero as possible to allow the variable potions of different sessions to be compared to each other. Typically all curves had to have at least some correction to zero, so from this standpoint the original observation of Silvertooth that at some point in the observations the difference in wavelength between SWD and PD was vanishingly small (the displacement becomes “unmeasurably large”) was not confirmed. However, if we assume temporarily that some fixed instrumental error in beam alignment may be preventing this from happening we can proceed on this basis to examine the session data, which is presented in Fig 6 in sidereal time and in Fig. 7 in local time. This data was predominantly derived from the second optical arrangement of Fig. 5. It can be seen from both figures 6 and 7 that a 12 hour pattern is visible and reminiscent of the projected appearance of the “Silvertooth effect” drawn in Fig. 1. Interesting, the minimum of Fig. 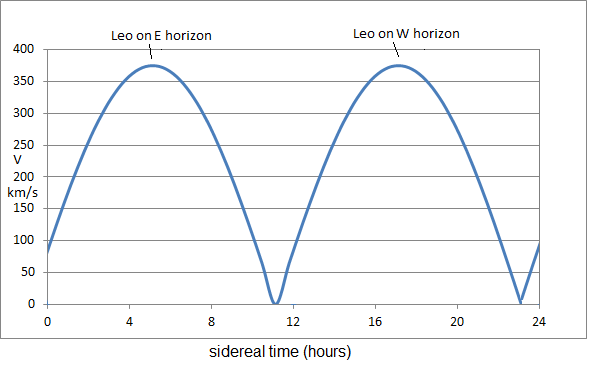 6 converges around 11AM sidereal time when Leo is perpendicular to the beam direction, and peaks occur 5 hours and 17 hours sidereal time when Leo is on the E or W horizon respectively. However, the persistence of a pattern in local time may also mean that this pattern is due to some local phenomenon. It had been the assumption of Silvertooth that the wavelength of light should become shorter when the laser is pointing towards Leo (or direction of motion) and should become longer when we are pointing in the opposite direction, towards Aquarius. This is because of C=fl and the assumptions on the relationship between the speed of light and its wavelength when C is constant only in the preferred frame of the CMBr. Assuming Silvertooth’s method above may actually be detecting this wavelength change, it is still not capable of discerning the direction, since with his method we can only detect the relative change is the apparent wavelength between the two detectors, but can’t distinguish which one has the shorter or longer wavelength. After considering this problem I decided that the solution would be to visualize each of the wave-trains passing through the SWD and PD detectors over some significant portion of the movement of the stage, such that the actual wavelength measured at each detector could be measured. This would then allow the determination of which is the shorter and which is the longer. In order to do this, it was decided to use an amplified piezo actuator to repeatedly move the stage back and forth along the optical path by some fixed distance, and then to capture the wave-trains generated at the two sensors simultaneously in a digital storage scope. These wave-trains could then be examined and the phase differences over the course of the actuation measured to determine both the magnitude of the phase change as well as determining which one was longer and which shorter. Since this method essentially generates two “frequencies”, I chose by convention to call the frequency at the SWD detector “F1” and that at the PD detector “F2”. The optical arrangement 2 was thus modified to incorporate this amplified piezo actuator, which was driven by its own H.V. signal generator. In this set of experiments the piezo-controlled mirrors did not need to be actuated since the rapid movement of the stage itself was sufficient to generate the AC signals at the two sensors. The schematic diagram of this setup is shown in Fig. 8 below. Fig. 8: Block diagram of the F1 –F2 apparatus. For the signal driver I used a 0.5 Hz ramp signal from a PWM circuit being driven by a PIC16F777 processor. This provided the sufficiently slow oscillation rate. This in turn was amplified to between 30-140V using a piezo driver circuit based around the PA78 operational amplifier which served to drive a Pi P601.4 amplified piezo actuator with a total range of 400um. Generally the drive voltage was selected to generate between 50-200 waveforms per stroke of the actuator. An example of wave-trains from SWD and PD sensors to be subjected to wavelength analysis is shown below in Fig. 10 – the F1 signal is on top, the F2 signal on the bottom. As in the first setup, the apparatus was aligned such that the laser beam is directed through the SWD sensor along a line that is horizontal and passes through the cardinal east direction. Data was collected in the following manner – as before, the laser would be started and allowed to stabilize, followed by applying the stabilization lock. The actuator would then be started and the waveforms would be captured by freezing the frame on the digital storage oscilloscope. This frame would then be expanded and photographed at intervals along the entire length of the captured wave train. The progressive phase shift between F1 and F2 from the start to the end of the wave-trains would then be measured, and this value was then converted to the appropriate units of velocity compatible with Silvertooth’s original method. Data was collected every 1-3 hours over approximately 12 hours per session. The results of 8 sessions performed between Dec. 2011 and April 2012 are shown below in Fig. 11 and 12, normalized as before. 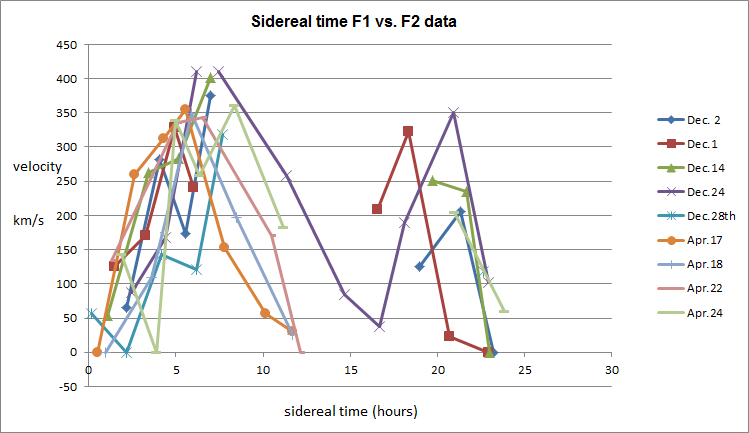 The results are displayed in sidereal time and local time. Similar to the observations using Silvertooth’s original method, the sidereal data again showed a peaking of the data around 5hrs and 17-22 hours sidereal time, and a trough around 11-12 hours and 24 hours. This pattern was again somewhat characteristic of the anticipated “Silvertooth effect”. The local time data tended to show a peak around 15hrs and just after midnight local time, with a trough at around 18-19 hours local time. 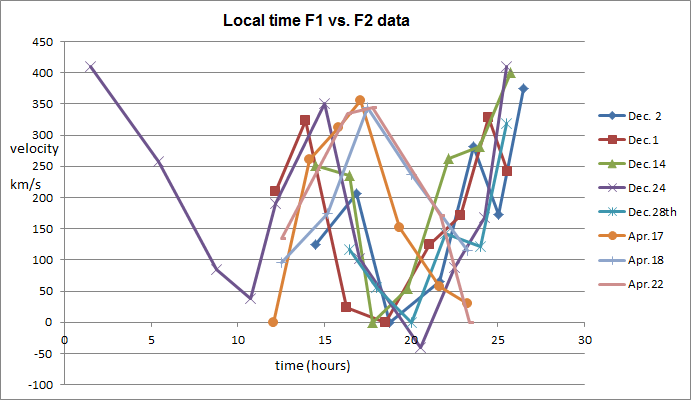 The local time pattern resembled the pattern seen in Fig. 7. Interestingly, it was observed that in virtually all cases, the frequency of the wave-train from the SWD sensor was almost always less than the frequency of the PD sensor on the Michelson interferometer side, and this was the case for both peaks observed in the diurnal pattern. This observation suggests that what is being observed is not the wavelength change expected by Silvertooth, since the F1 signal should become higher in frequency than the F2 signal when Leo is on the eastern horizon (since the laser is pointing east). F1 was always lower in frequency (longer in wavelength) than F2 when Leo was on either the eastern or western horizon. 1) A 12 hour diurnal change in the apparent (presumed) wavelength difference between that measured at SWD and PD does exist as was claimed by Silvertooth. 3) If one uses Silvertooth’s method of calculating velocity from the results, after normalizing for instrumental offsets, one gets a velocity range that on average approximates our expected motion with respect to the CMBr. 1) The difference between the wavelengths measured at the SWD and PD sensors is not usually zero when the device is perpendicular to our motion through space – a significant offset usually exists which needs to be corrected to arrive at Silvertooth’s predicted velocity. 2) There is a large variability in the wavelength difference at the same sidereal time from day to day. 3) The expectation that the wavelength measured at SWD would be smaller than that measured at PD when Leo was on the eastern horizon was not confirmed, instead, the opposite occurred. 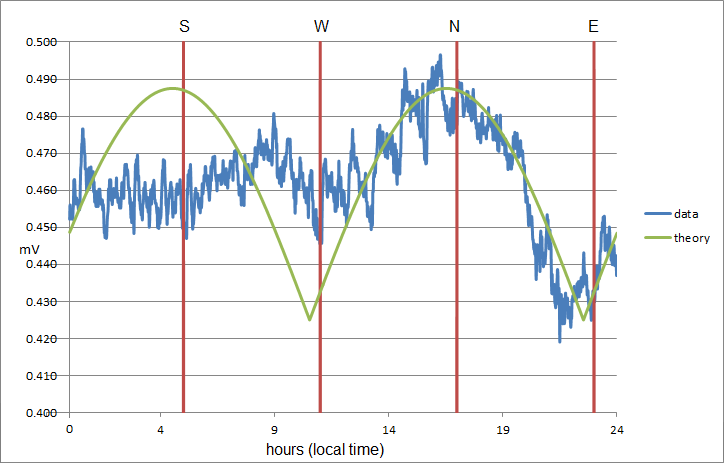 4) The 12 hour diurnal change also occurs in local time so the sidereal correspondence is not unique. The first issue is that this observation is actually wrong based on Silvertooth’s own theory. When Leo crosses the south cardinal direction it does so at an angle above the horizon of about 33 degrees in December from the latitude of Olga, Washington. When it crosses the north cardinal direction it does so at an angle of around 48 degrees below the horizon. So there should always be some smaller velocity component of motion detectable when the device is pointed north or south, just lower than when pointed east and west. Further, this pattern of change in D should be 6 hours out of phase between the two orientations. The latitude at Toronto is not much different that Olga, Washington, so a similar result would be expected here. I decided to test this idea by re-running the experiment but now changing the orientation of the SWD sensor from E-W to N-S as shown below, keeping all else the same. Fig. 13: SWD sensor moved from the E-W position to the N-S position. 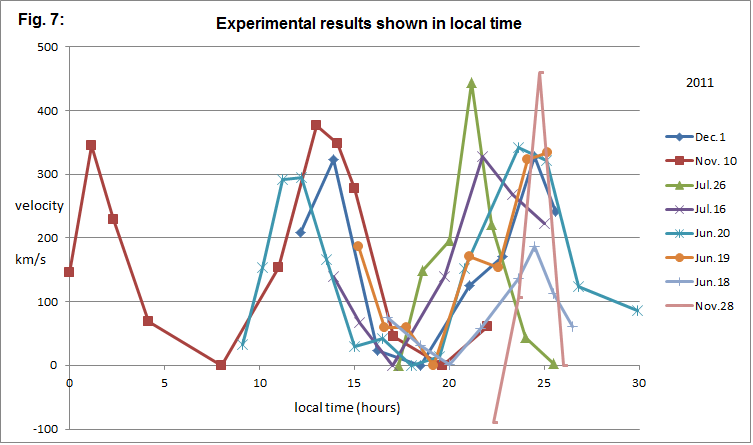 The result of this experiment, from Dec. 28th, 2011, is shown below. 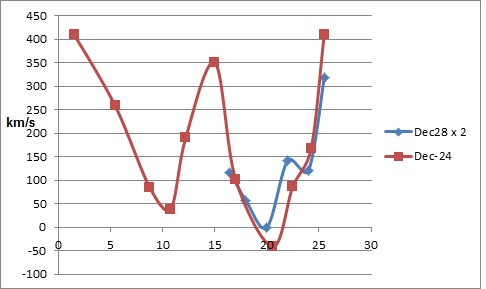 Although the Dec. 28th result was smaller as expected (it is multiplied by 2 in the graph for comparison purposes), it remained in phase with the test of 4 days prior. This result suggested that the orientation of the SWD sensor in the beam path has no effect on the resulting determination of D, which is at odds again with Silvertooth’s theory. However, a similar experiment was performed where the laser was turned 90 degrees in the apparatus rather than the SWD sensor – in this test the pattern did shift by about 3 hours from the expected pattern (data not shown). This result suggested that it is the laser and not the other components in the optical system that may be responsible for the effect. Examining the HeNe laser as the possible source of the “Silvertooth effect”. Focus was now placed on the HeNe laser as being potentially responsible for the diurnal pattern of apparent wavelength change observed in the experiment. It had been noticed in prior experiments that slight adjustments in the alignment of the mirrors during a reading session would skew the phase shift graph up or down at that reading. An example is shown below in Fig. 15. The problem with this argument is that this twisting misalignment would occur for all readings likely in a similar way – so this may account for some fixed errors (such as the fixed offset shown above) but does not account for the diurnal variation effect in and of itself, unless it can be demonstrated that this kind of misalignment is actually occurring diurnally due to some unknown factor(s). However, since the beam alignment change appeared to be able to mimic the apparent wavelength change, I turned my attention to the HeNe laser itself to determine if there was any reason to believe that the beam exiting the tube was not stable in its angle to the apparatus. I performed a long series of experiments on this using a four quadrant photodetector and data logger setup which is fully described in the companion paper to this article: A Four Quadrant Photo Detector for Measuring Laser Pointing Stability (2012) . To address this issue briefly, it was discovered that HeNe lasers do in fact exhibit significant drift in their beam exit angle that could affect the results of interferometer experiments such as this one. However, is this beam angle wandering a factor in Silvertooth’s experiment? Applying a 4 quadrant photodetector into Silvertooth’s interferometer, such as putting it in the place of PD presents some problems, as is outlined in the example below in Fig. 16. Let’s consider this simplified arrangement in which a HeNe laser beam is split into two beams at a beam splitter (BS1), one beam going directly to a 4 quadrant detector, the other going to a distant mirror and being reflect back to the quadrant detector by a second beam splitter (BS2). After following these different paths, let’s assume the two beams diverge at the detector by some variable angle q due to the wandering of the HeNe laser exit angle. This is shown in Fig. 16 by the blue lines. Since there are two separate beams moving symmetrically along opposite quadrants as the angle changes, the net effect of their progressive divergence will be measured as close to zero, since they will cancel out in the X output while the SUM output will remain conserved. 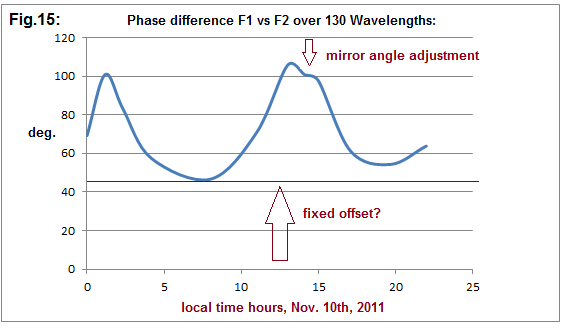 This is what appears to have happened when I actually performed this test using a 4 quadrant detector, as shown in Fig. 17 below. The X and Y drift were measured as flat over 10 hours of observation. Fig. 17: No visible beam drift along X or Y when PD is replaced by a quadrant photodiode. However, I worked out an alternative approach to measuring beam divergence at the detectors in Silvertooth’s experiment based on interference intensity. The intensity of the interference signal at each detector was routinely seen to be highly sensitive to how perfectly parallel the two intersecting beams were. I decided to use this observation to develop a way to monitor the beam angle changes at the detectors. This was done by adjusting the interference signal at each detector using the mirrors to a point where a slight change in the mirror angle would cause a large change in the interference amplitude at the detector. Then the AC signal generated at each detector by the moving actuator was rectified and displayed on voltmeters for monitoring over the course of a given session. 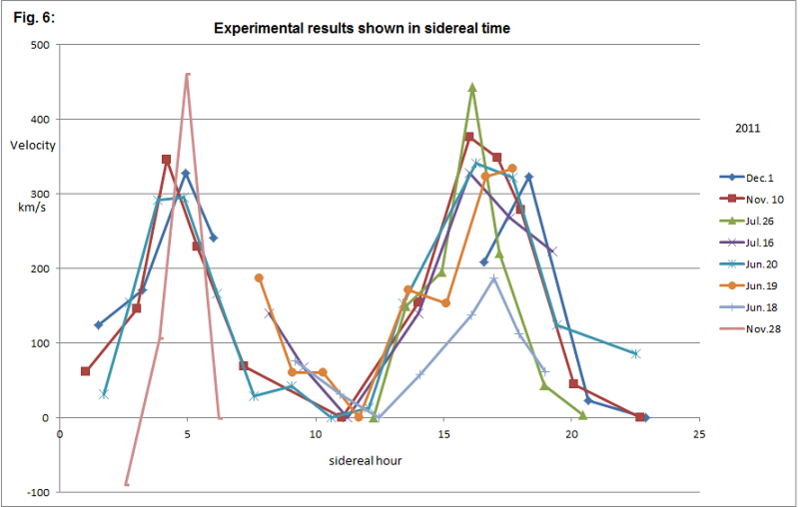 This was applied to both the SWD and PD sensors, the results are shown below. Fig. 18: Observable change in interference intensity over time at SWD or PD. When performed this way, the” Silvertooth effect” became immediately visible, now as a amplitude change in the interference signals at each detector. In fact the effect was clearer at the Michelson detector than at the SWD detector – implying the SWD detector is in no way required for measuring this diurnal change. At this point I was still not clear on what the sidereal or local phenomenon responsible for the diurnal pattern seen in the interferometer really is. However, the discovery that this effect can now be seen in the interference intensity at a single detector made it possible to apply more sophisticated data logging techniques to understand what is going on. I returned to the simplified interferometer shown in Fig. 19 which had only one interference detector, and was modified slightly from the usual Michelson arrangement to the one shown in the diagram, with the purpose of preventing any beam components from travelling back towards the laser where they might destabilize it. A data logger was used to collect measurements of the interference intensity at the PD sensor over the course of 12 days during the November and December, 2012. As before, an AC signal was generated at the photodetector using the piezo actuator (PZT) to move one beam past the other. This signal was converted to DC using a rectifier circuit, which then was read by an A/D converter in our PIC16F777 data acquisition system. Thereby a sampling of the interference intensity was made once per second, and averaged each minute in the data logger before being sent in real time to an Excel spreadsheet for analysis and graphing. This data is shown in Fig. 20 below, and is based on over one million measurements averaged to approximately 17,000 data points. Fig. 19: Interferometer for measuring HeNe laser drift at the PD detector. 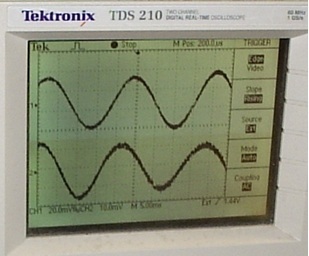 The amplitude (in volts) of the interference signal is on the Y axis, and the local time (in days, 2012) is on the X – axis bottom. The green and purple lines mark the local time when Leo crosses a particular cardinal direction in the sky. 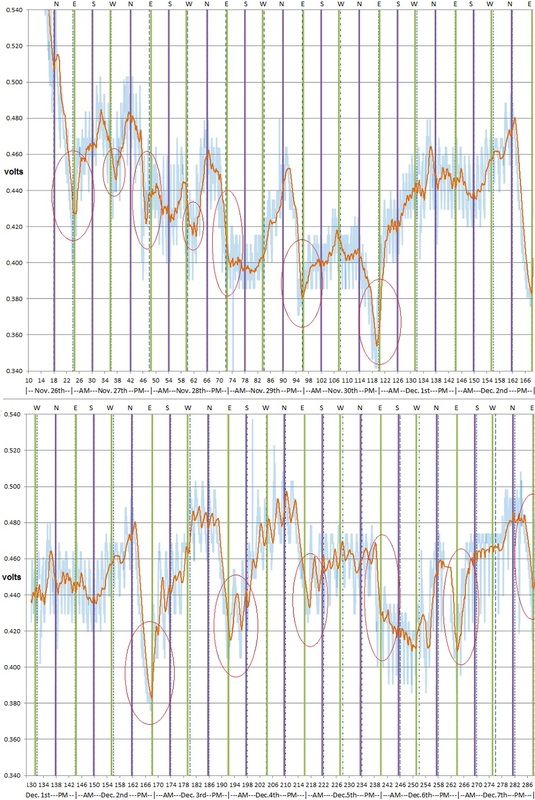 Green is for E or W, purple is for N or S. The raw data is shown in light blue – it was very noisy so a 90 minute moving average of the data is also shown in orange. It became immediately evident as this data was collected in real time that room temperature was playing a big role in the fluctuations seen in the interference intensity – the spikes seen in the data, occurring every 50-70 minutes, are in fact due to the furnace cycles heating the room (forced air gas). Although these only caused the room temperature to change by perhaps 2-3 degrees Celsius per cycle, this caused a significant swing in the interference intensity. Interestingly, troughs in interference intensity tended to occur each day coincident with Leo passing over the eastern horizon. These events are circled. In two cases this also happened when Leo crossed the western horizon (also circled). Fig. 20: Diurnal change in interference intensity due to HeNe laser beam drift. On the very first day, the expected 12 hour two peak pattern of Silvertooth was observed – this then evolved into a pseudo 12 hour – 24 hour pattern. An average was made of the pattern over the first four days, as shown in Fig. 21. If one applies the anticipated “Silvertooth effect” pattern of Fig. 1 loosely to this diagram, we find at least a partial correspondence. If Fig. 21 is plotted in sidereal time (not shown), then the best correspondence likely occurs if one is the inverse of the other. The place where Leo crosses a cardinal direction in marked in red. Fig. 21: Four day average derived from Fig. 20. To further elucidate the cause of this effect, I then monitored the interference intensity vs. the drift in the lock voltage on the same frequency-stabilized laser, as shown below in Fig. 22. As was reported in our companion article on the four quadrant photodetector, the laser lock voltage appears to drift somewhat over the course of hours and days due to temperature pressure in the room. From Fig. 22 we can see that both the lock drift and the interference intensity follow the same pattern of change over 48 hours, including both showing the repeated swings in room temperature caused by the forced air gas heating of the room. Therefore the two effects must be linked – in fact, since the laser lock voltage drift appears to proceed the interference intensity drift by a few minutes, it would appear that it is the movement of the laser mode along its gain curve that is driving the beam angle drift. Fig. 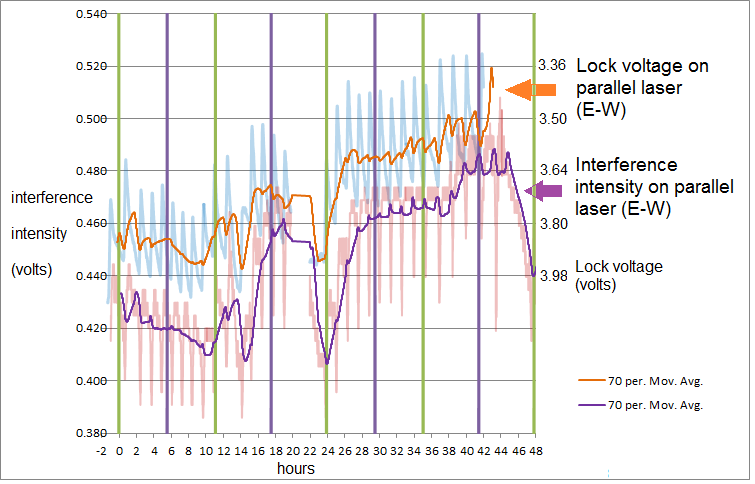 22: Interference intensity vs. laser lock voltage drift over 48 hours of measurement. Question 1: Does the beam drift on the current laser under test correspond to the lock voltage drift on a separate laser pointing in the perpendicular direction? Question 2: Can the diurnal pattern be accounted for entirely from room temperature changes? The following experiment was then performed on Dec. 8th – 9th, 2012. One laser was used to drive the interferometer of Fig. 19, and the other laser was also turned on but pointed at 90 degrees to the first (pointing N-S). With this second laser, I simply monitored the lock voltage drift over time. 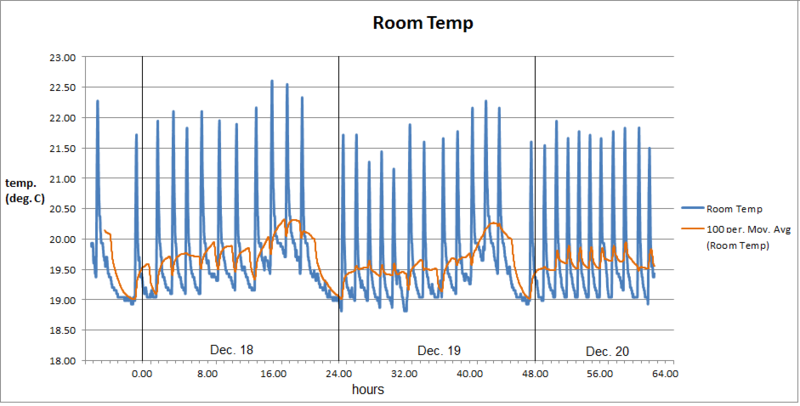 Simultaneously, I monitored the room temperature (starting Dec. 9th). All of this is shown below in Fig. 23. Over the course of Dec. 8th the room temperature was allowed to vary as usual. Starting at midnight and through Dec. 9th an electric heater was added with tighter temperature control to attempt to regulate the room temperature near the lasers. As can be seen from the graph, the forced air gas cycles were abolished by the electric heater intervention, with the room temperature slowly rising. Towards the latter part of Dec. 9th turbulent weather outside disrupted the temperature control, causing some temperature fluctuations, but these were closely paralleled by both the laser pointing E-W (in interference intensity) and the laser pointing N-S (in lock voltage drift). Fig. 23: Effect of regulating room temperature on the interference intensity. The electric heater was turned off at hour 50, which led to a steep fall in the room temperature. Both lasers responded by a similar fall in their readings. This close correspondence between the laser interference pattern, lock voltage and temperature was strong evidence that diurnal temperature changes are the sole source of the “Silvertooth effect.” The fact that the laser pointing E-W and the Laser pointing N-S showed the exact same pattern of change indicates that the direction the apparatus is pointing has nothing to do with the effect observed. I then monitored the room temperature for a further 3 more days allowing the temperature fluctuations to occur normally, using automatic data logging. As can be seen from the graph below (Fig. 24), the diurnal pattern of change characterized in Fig. 21 can be clearly seen in the moving average, including the consistent drop near midnight each night which corresponds to the crossing of Leo on the eastern horizon (hour 0, 24 and 48 corresponds to midnight each night in this graph). The temperature curve suggests that this is due to a slowing of the furnace cycling in early evening, along with the outside temperature drop at dusk. It is a remarkable coincidence that this temperature drop occurs precisely when the constellation Leo is on the eastern horizon. Returning to the “Silvertooth effect” pattern observed in Fig. 7, it’s now obvious this pattern is nothing other than the inverse of the room temperature pattern of Fig. 24. Fig. 7 is shown again below for reference. The trough at around 18:00 hours is in fact the inverted daytime thermal peak due to the action of the sun, and the peaks at around noon and midnight appear to be due to the lower room temperatures in the morning and late evening, again inverted.The curve is inverted likely because the primary effect of rising room temperature on the laser is to bring the two interfering beams closer to parallel in Silvertooth’s interferometer. After considerable study as detailed in this report, the “Silvertooth effect” as I have called it can now be fully explained. 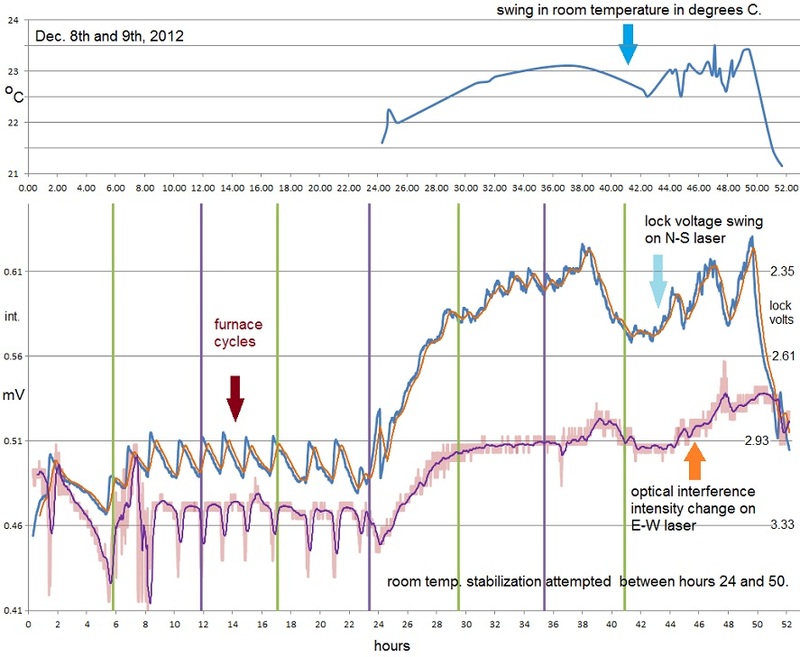 The diurnal change in room temperature, due largely to a combination of the heating/cooling cycles of the sun and routine human activity, cause slight changes in the beam exit angle from a HeNe laser tube. 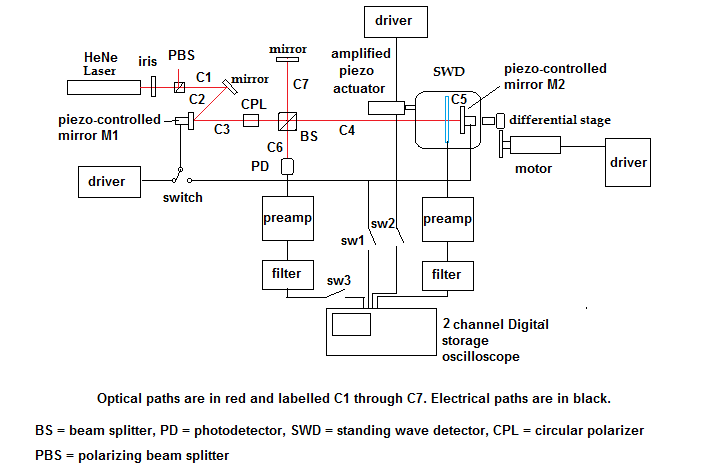 This in turn changes the length of the beam paths in the optical circuit, and ultimately the angle at which the beams intersect in interference at the photo-detectors SWD and PD. The net result is that when the stage is moved along these intersecting paths, the number of wave peaks and troughs counted at the detectors will differ in proportion to the temperature induced change in the beam angles. Thus the result of this experiment is not evidence of any directionally dependent difference in wavelength – it is in fact only a very elaborate thermometer! In Silvertooth’s own experiments this temperature effect was likely more dramatic since his laser was not frequency-stabilized. This revelation is undoubtedly a deep disappointment to many who held on to the notion that this experiment might represent elusive evidence of an optically detectable ether. Although I personally recognized that this experiment should in theory not work, I had hoped that perhaps Silvertooth had stumbled upon some fluke for breaking the so called “conspiracy of light.” My own persistence with this experiment was because of the uncanny correlation of the diurnal pattern in the data with the alignment of the interferometer along our direction of motion through space, which now appears to be simply a bizarre coincidence. This result is consistent with the findings of our previous standing wave interferometer experiment A Single Laser One-Way Speed of Light Experiment using a Standing Wave Interferometer (2011). In that paper the null result was explained on the basis that according to Lorentz’s exact theorem of corresponding states (1904) the effects of time dilation acting on the laser source and the Lorentz contraction on both the source and the optical paths will serve to insure that the interference positions of light and darkness will be conserved during the rotation of the apparatus, even if a preferred frame of reference for light exists. This also holds true for any attempt to measure the wavelength of light along any given path – if the positions of light and darkness are always conserved, then the apparent wavelength along any path must always be measured to be the same regardless of direction. Similar to the proposition of Tyapkin’s "On the Impossibility of the First-Order Relativity Test", a one way wavelength of light test is just as impossible to perform as a one-way speed of light test. Interestingly, Silvertooth was aware of this paper by Typakin and even quoted it in his first and third paper, and yet ignored its relevance to his own work. The relativistic proposition is of course neither confirmed nor denied by this exercise, since both special relativity and Lorentz ether theory (1904) would similarly call for a null result in this experiment. This outcome reinforces the necessity of a philosophy towards science where initially positive results should be subjected to continued and rigorous scrutiny, in the spirit of Popper. Silvertooth’s experiment is clearly a case where even when the experiment obeys your prediction, this does not necessarily mean that the theory is true, particularly if all possible scenarios that could prove your theory false have not been ruled out. 2 ) E.W. Silvertooth, S.F. Jacobs (1983) Applied Optics Vol. 22 No. 9, p. 1274-5. 3 ) E.W. Silvertooth, “Experimental Detection of the Ether” (1986) Spec. Sci Tech. Vol.10 No.1 p.3-11. 4 ) E.W. Silvertooth, “Motion Through the Ether.” (1989) Electronics and Wireless World. 5 ) E.W. Silvertooth, C.K. Whitney, (1992) “A New Michelson-Morley Experiment.” Physics Essays Vol. 5 No. 1 1992 P. 82 -89. 6 ) Chalmers W. Sherwin, (1989) “An Analysis of the Silvertooth Experiment.” Physics Essays Vol. 2 No. 2 P. 125 – 127. 7 ) Tyapkin, A.A., (1973) "On the Impossibility of the First-Order Relativity Test." Lettere Al Nuovo Cimento Vo. 7, No. 15, 760-764. 8 ) Doug Marett : “A Four Quadrant Photo Detector for Measuring Laser Pointing Stability (2012)” www.conspiracyoflight.com.